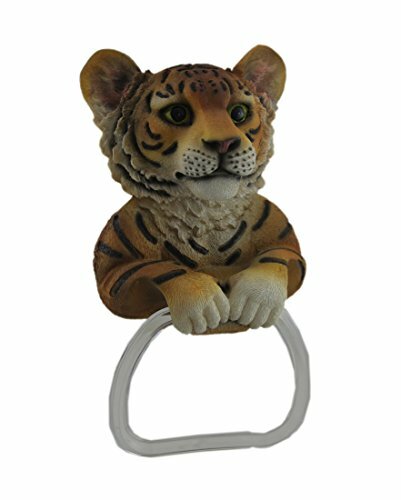 This adorable Bengal Tiger kitten towel holder is a great addition to any bathroom. Creatively cast in polyresin, the towel holder mounts easily to a wall, with just a few screws (not included). It is carefully hand-painted, with glossy black eyes, and looks very realistic. The clear plastic towel ring the tiger holds is just the right size for guest towels. The piece measures 11 inches tall, 6 inches long and 3 1/2 inches deep. It's a must have for any tiger lover.